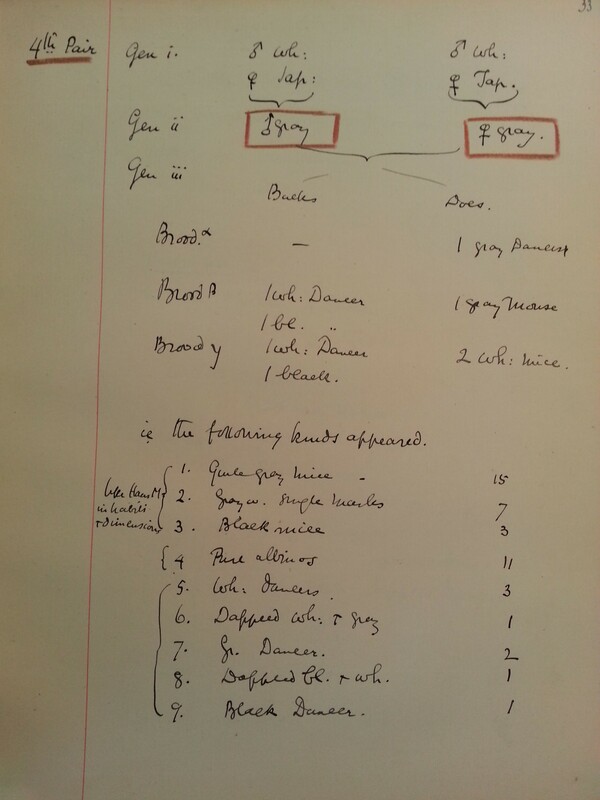 In 1911, the University of Edinburgh appointed its first Lecturer in Genetics. The Lectureship was the first academic genetics post in Britain – the Balfour Chair in Genetics at the University of Cambridge did not come into existence until a year later. The incumbent of the Lectureship was a man called Arthur Dukinfield Darbishire, a scientist who had already caused a stir in the so-called ‘Mendel Wars’. Darbishire was educated at Balliol College, Oxford, where he studied zoology. But in 1899, a discovery (or, rather, rediscovery) was made which changed the face of science forever. Three scientists independently stumbled across the findings of an Augustinian monk, Gregor Mendel, who had conducted a perfectly-designed study of inheritance and transmission of characteristics by cross-breeding peas growing in his monastery garden. Mendel’s ideas – his discovery of the 3:1 ratio of dominant to recessive types (terminology which he coined) and his hypothesis of invisible ‘factors’ – which we now call ‘genes’ – causing certain traits in predictable ways, were published in 1866, but remained virtually unknown for over three decades. When they were finally rediscovered, the science of ‘genetics’ was born. Excitedly, Darbishire soon deviated from pure zoological studies to pursue problems of heredity. In the first few years of the twentieth century he began a series of breeding experiments, crossing Japanese waltzing mice with albinos to demonstrate the variability in the distribution of inherited coat colour. 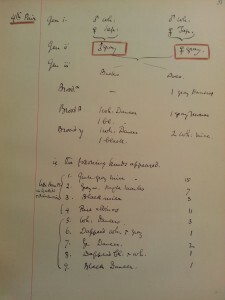 One of his research notebooks (pictured) from around this time, which exists in Edinburgh University Library Special Collections, reveal his neatly outlined hybridisations and notes from research and reading. 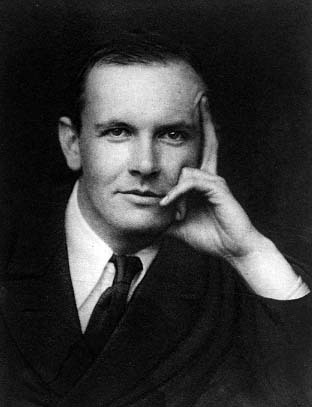 At this point, Darbishire’s interests lay in the biometric rather than a Mendelian approach to heredity (the premise that heredity relies on continuous rather than discontinuous variation), but when he became Demonstrator in Zoology at the University of Manchester in 1902, he began to reassess the Mendelian approach. He continued his experiments with mice in the light of his earlier biometric position, and concluded that the supposed contradiction between the two theories was due more to differences of opinion rather than inherent theoretical incompatibilities, despite the heated and bitter debates between various scientists from both theoretical camps. Caught in the crossfire, Darbishire cut himself adrift from both schools of thought, maintaining an independent and critical distance. Darbishire left Manchester for a spell as Senior Demonstrator and Lecturer in Zoology at the Royal College of Science before his appointment to the University of Edinburgh. Once he took up his position as Lecturer in Genetics, Darbishire had the run of the University’s Experimental Farm for his breeding experiments. By 1914, Darbishire was delivering lectures at the University of Missouri, Columbia, and was so successful that he was offered professorships from two American universities. However, Darbishire felt he could not leave England after the outbreak of war. Upon returning, he was pronounced unfit for the Army (due to ‘physical delicacy’) but in July 1915 he tried a second time at a recruiting office, where he was accepted and enrolled as a private in the 14th Argyll and Sutherland Highlanders. 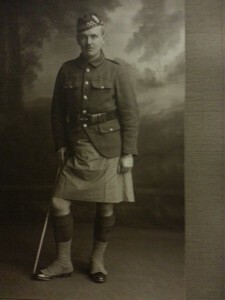 His sister Helen wrote that ‘[h]e devoted himself to his duties as a soldier with the same zest and the same meticulous attention to detail that marked his work in other spheres, and he won the love and admiration of his comrades.’ However, within less than six months, Darbishire contracted cerebral meningitis whilst in military camp at Gailes. He died on Christmas Day 1915. Three days after his death, he was gazetted Second Lieutenant in the Royal Garrison Artillery. Had he lived, Darbishire would doubtless have taken on the directorship of the Animal Breeding Research Station, established in 1920 to apply the new science of genetics to the practical improvement of the farming and livestock industry. The directorship of the Station (later the Institute of Animal Genetics) passed instead to one of Darbishire’s students, Francis Crew, who transformed the Institute into one of the foremost centres of genetics research in the world, and laid the foundations for Edinburgh’s continuing excellence in the biological sciences. Edinburgh University Library Special Collections holds various items relating to Arthur Darbishire, many of which have been catalogued as part of the Wellcome Trust-funded ‘Towards Dolly’ project. As well as his notebook, there are some photographic portraits and his collected offprints, many bearing his signature. These items are intimate souvenirs of the life and legacy of Edinburgh’s first geneticist. All who knew him will keep in memory a personality alive and young to a rare degree, fulfilling itself in a passion for music, much laughter, a perfectly disinterested love of truth, a delight in producing delight in others, and the keenest possible interest in life itself whichever way it led him. This entry was posted in Uncategorized by towardsdolly. Bookmark the permalink.